Young children and students continue to spend more and more time keyboarding for written expression. 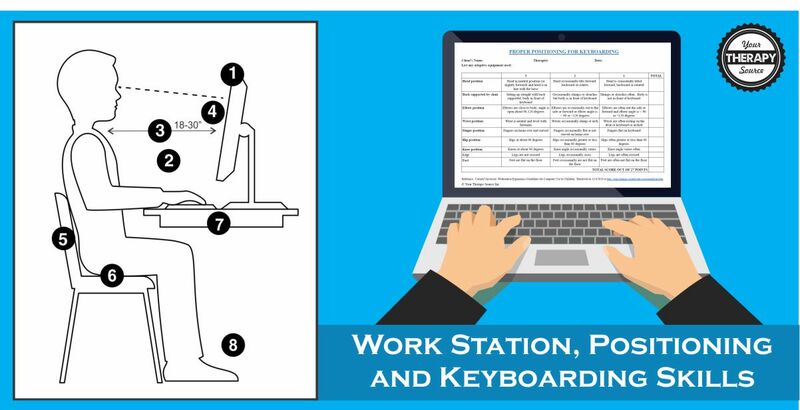 Whether it be at home before children are school aged or sitting long hours typing away throughout a child’s educational career or even as adults, the work station must be set up efficiently to allow for proper positioning while keyboarding. 1. The top of the monitor screen is at or below eye level. 2. The monitor and the keyboard are directly in front of the head and body. 3. The viewing distance from the individual to the computer monitor is somewhere between 18 and 30 inches (about arm’s length). 4. There is no glare (i.e. from windows or lights) reflecting on the monitor screen. 5. The seat provides support for the lower back. 6. The seat width and depth are suitable. 7. The work surface is at the proper height (i.e. forearms are horizontal or angled slightly downward). 8. Legs and feet have enough space under the work surface. 9. Any accessories (i.e. computer mouse) are within reach. • assess proper positioning while keyboarding. • assess changes in performance over time in one individual. • inform the individual of what is expected for the task. • increase consistency of scoring. 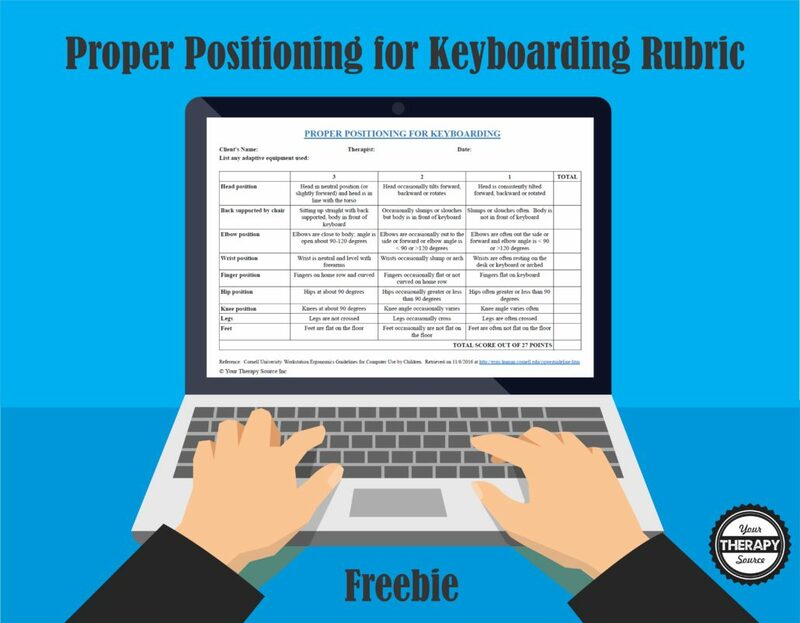 • promote learning/ education on proper positioning while keyboarding. This post is part of the Functional Skills for Kids: 12 Month series by Occupational and Physical Therapists. You can read all of the functions on childhood HERE. Read all of my monthly posts in this series HERE. Looking for more information about the development of the functional skills of keyboarding? Stop by to see what the other occupational therapists and physical therapists in the Functional Skills for Kids series have written. When is My Child Ready to Learn to Keyboard? | Miss Jaime, O.T. 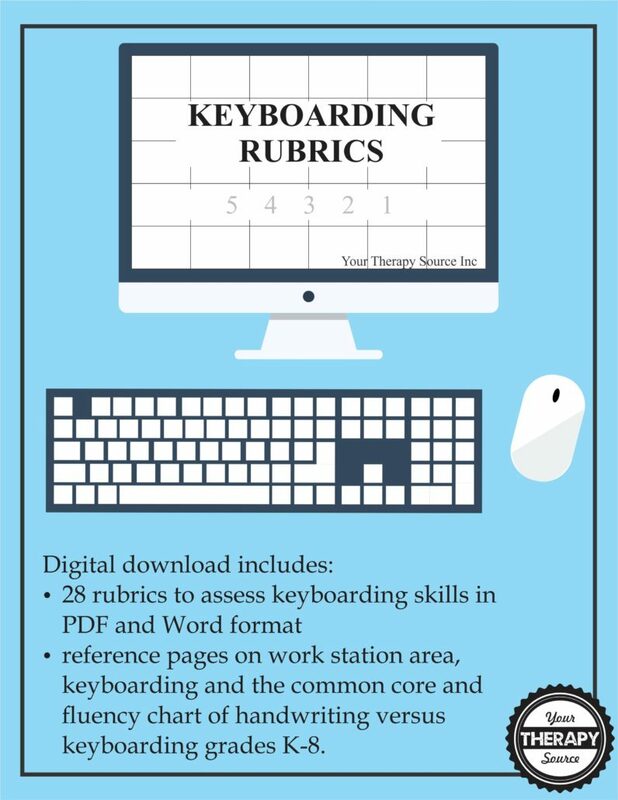 Keyboarding Rubrics digital download includes 28 rubrics to assess keyboarding skills in PDF and Word format. Also includes 3 references pages on work station area, keyboarding and the common core and fluency chart of handwriting versus keyboarding K-8. Find out more information.